Help save a bird-species from becoming extinct in the wild. 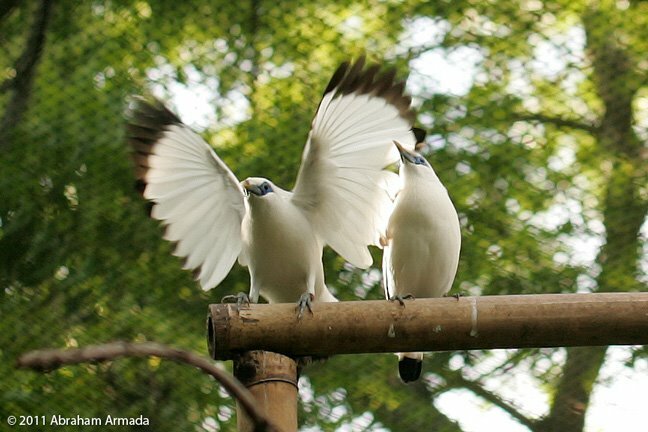 Join our Bali Starling Conservation project, or sponsor another endangered bird for rehabilitation and release in our Bali bird sanctuary on Nusa Penida. Using local community-based protection, we have transformed the Balinese island of Nusa Penida into a sanctuary where endangered birds can be released to live and breed safely in the wild. We need your help to acquire endangered birds from animal rescue centres and certified breeders, which we can then rehabilitate and release within the sanctuary. Please consider sponsoring a bird. Your support will help to save a bird-species from becoming extinct in the wild. By sponsoring a bird, we can acquire an endangered bird from a certified breeder (or, if possible from an animal rescue centre) and relocate to our rehabilitation facility on Nusa Penida (Bali). The birds are rehabilitated to survive in the wild by our experienced staff. This will take a minimum of 3 months, but can take upto a year, depending on the age of the bird, the species, and it’s prior opportunity to develop survival skills. We release the birds at a traditional Balinese temple ceremony with the local community. This ensures that the community participates and adds an additional layer of spiritual protection to the birds. We are currently looking to release more Bali Starling, Black Winged Starling, Java Sparrow, Lesser Sulphur Crested Cockatoo and other birds. Bali’s official emblem bird, and one of the most beautiful and rarest birds in the world. In 2005, there were less than 10 remaining in the wild in Bali, despite the release of many hundreds into the West Bali National Park from the mid1980s by the Indonesian government and NGOs. Conversely, FNPF rehabilitated and released just 64 onto Nusa Penida in 2006/7, and by 2009 there were over 100. FNPF motivated and mobilized all 41 villages on Nusa Penida to use community-based protection to overcome poachers. We are work with many parties to increase number of Bali starlings on Nusa Penida until the population is stable in terms of numbers and genetic diversity. We are working with multiple breeders to increase the genetic diversity of the original 64 birds that we released in 2006/7 by releasing at least 10 birds each year from a variety of breeders, with the first release in 2011. Plus we are installing nestboxes on Nusa Penida that were specifically designed for Bali Starlings, to help increase their breeding numbers and frequency. A single bird from a certified breeder costs approx US$ 875 (Indonesian Rp 7.5m). This bird is very rare on Bali (and is potentially extinct). But because it does not have the same status as the Bali Starling, and because its distribution is much wider than Bali, it is not classified as being endangered. FNPF is working to restore a viable polutaion back on Bali. There were just three wild birds (all female) remaining on Nusa Penida in 2009 and none remaining on the main island of Bali. In 2010 we successfully rehabilitated and released 2 male birds. We want to rehabilitate and release more of these beautiful birds onto Nusa Penida. A single bird costs approx US$ 850 – US$1,000 (Indonesian Rp 7 million – 9 million). Please contact us at info@fnpf.org if you would like to support this project.